Sneezing? Itchy Eyes? Runny Nose? It may be allergies! 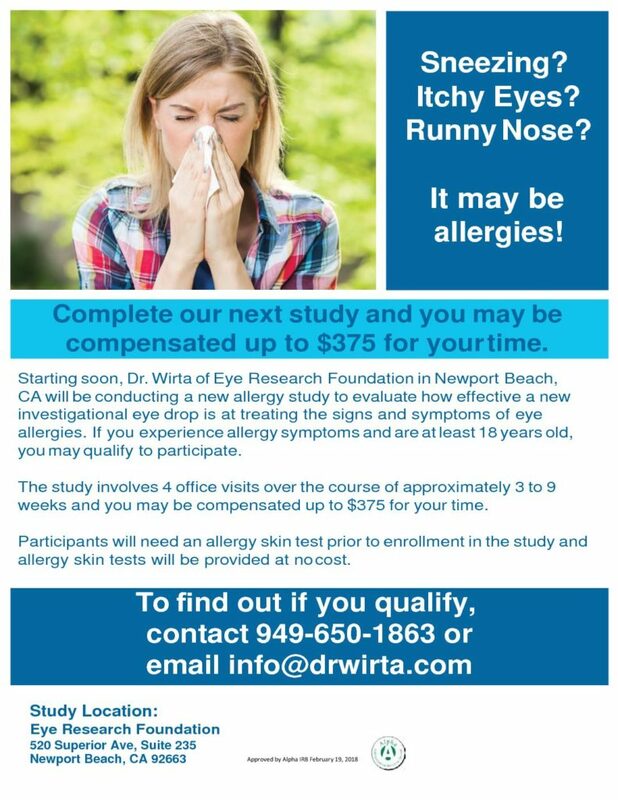 Starting soon, Dr. Wirta of Eye Research Foundation in Newport Beach, CA will be conducting a new allergy study to evaluate how effective a new investigational eye drop is at treating the signs and symptoms of eye allergies. If you experience allergy symptoms and are at least 18 years old, you may qualify to participate. The study involves 4 office visits over the course of approximately 3 to 9 weeks and you may be compensated up to $375 for your time. Participants will need an allergy skin test prior to enrollment in the study and allergy skin tests will be provided at no cost.